Looking for pizza in New York? Well, Google thinks that three results are simply not enough, you need 10. Yes, it is now official, Greg Sterling's Google Maps: From "OneBox" To Ten Local Links has the official word on the ten local results. 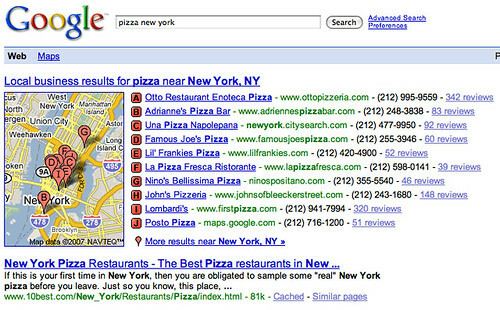 Google will now show ten links instead of three for the local results. Why? Google said today that the reason it's showing more links is because usability testing revealed that many people didn't realize there was additional local content available beyond the three listings, despite the "more results . . ." prompt. Accordingly, Google said that with the 10 links it is hoping to signal people that there is much more local content a click away. A WebmasterWorld thread is now going back and forth on if this is good for SEOs or not. One person says "the party is officially over," while someone quickly responds, "exactly the opposite." Which is it? It depends on how good you are at local optimization. For more tips and discussion on this new Google Local web search integration, join the discussion.